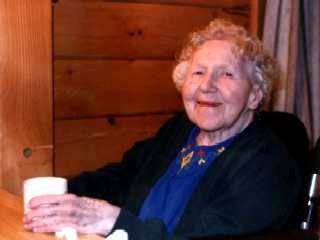 Annie (Brennan) Gill of 7 Orchard Street, Everett died suddenly on Tuesday, January 12th. Annie was born in Kenmare, Co. Kerry, Ireland on August 15, 1912. She immigrated to the United States (Cambridge) in 1930. After working locally then in New York, Indiana and Arizona as a "mother's helper", Annie settled permanently in Massachusetts, marrying the late Michael Gill of Clonmany, Co. Donegal, Ireland in 1937. The Gills moved to Everett from Charlestown in 1952. Annie is survived by nine children, Mary Ann Sheehy of Quincy, Timothy of South Boston, Michael, Gerard, Rita, Stephen and James, all of Everett, Annie Gill-O'Toole of Marlboro and Edward of Maui, Hawaii. Annie also leaves behind 14 grandchildren. Annie joins her daughter Marguerite (1947), granddaughter Suzanne (1986), daughter Carol Dion (1995) and son George (1996) in eternal rest. One of 18 children, Anne leaves behind her sisters Helena Byrne of Chicago, Margaret Brennan and Julia Jackson of England and Joan O'Shea of Ireland. Also mourning her passing are countless nieces and nephews throughout the United States and Europe. A Funeral Mass was held on Tuesday, January 19th at the Immaculate Conception Church after a wake at the Gill residence. Anne is buried along with her husband Michael and daughters Marguerite and Carol at the Oak Grove Cemetery in Medford, Massachusetts. Memorial contributions may be sent to Boston Catholic Television Center, 55 Chapel St., Box 9109, Newtonville, MA 02460-9109.